The house at 32 O'Neills Road, Melton, is significant as a moderately intact example of a Late Victorian style and for its associations with residential developments in Melton in the late nineteenth and early twentieth centuries. The house at 32 O'Neills Road is of architectural interest. Although altered, it still demonstrates original design qualities of a Late Victorian style. These qualities include the hipped roof form, together with the hipped bullnosed verandah that projects towards the front. Other intact or appropriate qualities include the single storey height, brick chimney (but not the overpainting), narrow eaves, corrugated profile sheet metal roof cladding, central timber framed door opening and the turned timber verandah posts. The house at 32 O'Neills Road is historically significant at a LOCAL level (AHC B2). It is now a rare example of a house of its period in Melton, and a unique representation of the town's history. This is enhanced by its prominent location. It is also expressive of the farming history of the Shire. Overall, the house at 32 O'Neills Road is of LOCAL significance. The house at 32 O'Neills Road, Melton, has a modest front garden comprising an open grassed area and perimeter garden beds. There is a paved driveway at the side that leads to a rear garage. The front is bound by a timber picket fence, approximately 1300 mm high. 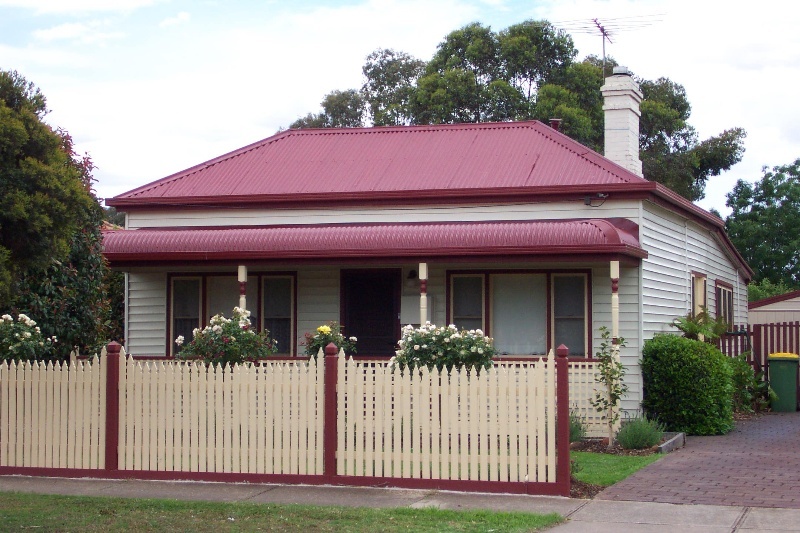 The single storey, metal weatherboard, Late Victorian styled house is characterised by a hipped roof form, together with a hipped bullnosed verandah that projects towards the front. These roof forms are clad in deep red corrugated Colorbond. An early brick chimney (now painted) with a corbelled top adorns the roofline. Narrow overhangs are features of the eaves. The square guttering has also been introduced. The front verandah is supported by turned timber posts and a capped timber balustrade that appears to have been introduced. Also introduced are the large timber framed double hung tripartite windows that may have replaced earlier single timber framed double hung windows. The central front timber framed doorway is early. The bullnose verandah has been renovated. Shire of Melton Historical Themes: 'Farming'; 'Community'.